Anthrax is a disease with an age old history in Africa caused by the Gram-positive endospore forming soil bacterium Bacillus anthracis. Epizootics of wild ungulates occur annually in the enzootic region of Pafuri, Kruger National Park (KNP) in the Limpopo Province of South Africa. Rigorous routine surveillance and diagnostics in KNP, has not revealed these rare isolates since the 1990s, despite unabated annual outbreaks. In 2011 a cheetah was diagnosed as anthrax positive from a private game reserve in Limpopo Province and reported to State Veterinary Services for further investigation. Isolation, molecular diagnostics, whole genome sequencing and comparative genomics were carried out for B. anthracis KC2011. Bacteriological and molecular diagnostics confirmed the isolate as B. anthracis. Subsequent typing and whole genome single nucleotide polymorphisms analysis indicated it clustered alongside B. anthracis SA A0091 in the B.Br.010 SNP branch. Unlike B. anthracis KrugerB strain, KC2011 strain has unique SNPs and represents a new branch in the B-clade. The isolation and genotypic characterisation of KC2011 demonstrates a gap in the reporting of anthrax outbreaks in the greater Limpopo province area. The identification of vulnerable and susceptible cheetah mortalities due to this strain has implications for conservation measures and disease control. Anthrax is a zoonotic disease with an age old history in Africa , causing acute mortalities. It primarily affects ungulates with episodic spill over into humans and carnivores [2, 3]. The causative agent of this disease is the Gram positive, endospore forming, exotoxin producing soil bacterium Bacillus anthracis [4, 5]. Sporulation is triggered by nutrient scarcity, the presence of bicarbonate and oxygen exposure [6, 7]. The virulence factors of this bacterium are on the two plasmids, pXO1 (181 kilobases) and pXO2 (94 kilobases), encoding the toxin and capsule genes respectively [8, 9]. The toxin complex is composed of three components namely, lethal toxin (LF) made up of the protective (PA) and lethal factor (EF) [10, 11]. The capsule consists of a five gene operon (capBCADE) that produces a poly-gamma-d-glutamic acid (PGA) on the bacterial cell membrane that protects the vegetative cells from phagocytosis [12, 13]. Anthrax was widespread across southern Africa in the early 20th Century, until the development and South African state implementation of the Sterne vaccine in 1937 [14, 15]. While livestock cases have since been infrequent due to vaccination practices; outbreaks are still common amongst wildlife in endemic regions of South Africa and game reserves across the continent [2, 16]. Limpopo province covers 125,754 km2 bordering Botswana and Zimbabwe to the north. The northern half of the Kruger National Park (KNP) makes up the entire eastern border of the Limpopo Province bordering Mozambique. The anthrax endemic region in KNP falls between the Limpopo and Luvhuvhu rivers . The distribution of outbreaks and the animal species affected by anthrax have been described extensively in KNP in the last 35 years [17–20]. The genetic population structure of B. anthracis consists of the global A, B and C clades . The B clade isolates identified in South Africa were confined to the northern tip of KNP in Limpopo Province due to it being an ideal soil environment for spore persistence . The A clade isolates, in contrast, have a wide distribution, predominating and prevailing over the rarer B clade isolates during outbreaks since the late 1980s. Host species differ in their susceptibility to B. anthracis. Wild ungulates are more susceptible to the disease than carnivores [2, 3]. Even amongst herbivores, roan antelope (Hippotragus equinus) are far more susceptible to anthrax than other antelope species . Similarly, cheetahs (Acinonyx jubatus) are more susceptible to the toxins produced by the bacterium than other carnivorous felids and canids [22–24]. It is hypothesised that this could be due to the immune response dictated by the monomorphic genetic structure of southern African cheetahs  or by the feeding habits of free roaming cheetah . In either event, it is of importance to cheetah conservation practices since these felids are considered vulnerable (bordering on endangered) . This status has led to more stringent investigations of cheetah mortalities in both captive and free roaming animals. In 2011 a cheetah mortality from a private game reserve in Limpopo Province was investigated by the local veterinarian. The cheetah was observed to have substantial facial oedema with unclotted blood around the kidneys (Fig. 1A, B). Biological samples from the cheetah were submitted for bacteriologic diagnostics (Fig. 1C, D). Colony morphology indicative of B. anthracis then confirmed the initial diagnosis (Fig. 1D). The isolate was then submitted by Skukuza State Veterinary Services for further analysis on behest of the Anthrax Advisory Committee. A Giemsa smear stain from the oedema fluid was performed for identification of B. anthracis. Pure culture isolation of KC2011 isolate was obtained by culturing biological samples directly onto 5% sheep blood agar after 24 h incubation at 37 °C characteristics including colony and cell morphology, gamma-phage and penicillin sensitivity were evaluated as described in OIE . Capsule formation was observed by visualization using light microscopy of Giemsa stained fluid and colonies. Genomic extraction of B. anthracis KC2011 was carried out using a DNA Blood Mini Kit (Qiagen, Germany) according to manufacturer’s instructions. The DNA was quantified using Qubit™ fluorometric quantitation (Invitrogen™, USA). Quality of the extracted DNA was visualized on 0.8% agarose gel electrophoresis. The diagnostic qPCR for B. anthracis was performed with 2.5 µL DNA in 1× FastStart™ Taq DNA Polymerase mastermix (Roche®, Germany) and 0.5 μM of each primer small acid soluble proteins (SASP), Bacillus anthracis protective antigen (BAPA), and capsule region (capC) along with 0.2 μM of probe for each chromosomal and plasmid target pairs with fluorescein on the one and LCRed640 on the other (Tib MolBiol GmbH, Germany) in a final volume of 20 µL as described in Turnbull . The PCR conditions on a LightCycler™ Nano (Roche®, Germany) were used as described in OIE [3, 27]. The PCR single nucleotide polymorphism (SNP) assay was performed for the oligonucleotide markers A/B.Br.001, B.Br.003, B.Br.004, B.Br.002, B.Br.001, A.Br.007 and A.Br.002 as described in Birdsell et al. . The reaction included 2.5 µL DNA diluted in 1× FastStart DNA Green Master (Roche®, Germany) with an ancestral forward and a derived forward SNP target primer (GC-clamp: no-GC-clamp) and a common reverse primer with a starting concentration of 0.2 µM depending on the ratio indicated which allowed for separation of melt peaks by at least 5 °C. Thermocycling parameters on the LightCycler™ Nano (Roche®, Germany) were conducted as described in Birdsell et al. .
Sequence libraries of the DNA isolate was generated using the Nextera DNA Sample Prep Kit (Illumina, USA) protocol. Sequence reads of paired end library was performed on a HiSeq 2500 sequencer (Illumina, USA). Quality of the genome sequenced reads were assessed using FastQC software 0:10.1 . Trimmomatic  was used to remove the ambiguous nucleotide reads. De novo assembly of the B. anthracis KC2011 was carried out using the CLC Genomics Workbench version 7.5 (CLC, Denmark). The assembled contigs were aligned with BLASTn  using B. anthracis Ames ancestor (GenBank: AE017334.2, AE017336.2, and AE017336.2) as a reference. Mauve tool  was used to align and order the assembled contigs using B. anthracis Ames ancestor as a reference. The genome was annotated using PGAAP at NCBI . The trimmed reads of B. anthracis KC2011 were aligned to B. anthracis Ames ancestor using the Burrows-Wheeler Aligner (BWA) . SAMtools  was used to sort and index the aligned sequenced reads. Unified genotyper in GATK  was used to call for SNPs. In order to construct WGS- SNPs tree, complete and draft genomes from different clades of B. anthracis available in NCBI Genbank (http://www.ncbi.nom.nih.gov) were included in this study (Additional file 1: Table S1). SNPs positioning sets were deducted from the aligned genomes of B. anthracis Ames ancestor using molecular evolutionary genetics analysis (MEGA) 7 . SNPs with informative sites (core SNPs) in all genome sequences were used for the phylogenetic tree construction using MEGA 7 tool . The genome sequence of B. anthracis KC2011 was deposited in the Genbank genome database under the accession number: NJGK00000000. A Giemsa stained impression smear from the oedema fluid revealed encapsulated, square ended bacilli pathognomonic for B. anthracis (Fig. 1C). The microbiological characteristics confirmed the bacterium to be B. anthracis on blood smear with typical B. anthracis colony morphology and structure on 5% sheep blood agar  (Fig. 1D). The B. anthracis KC2011 isolate was confirmed positive for the presence of B. anthracis BAPA, SASP and capC. B. anthracis KC2011 was further typed using Melt-MAMA and amplified the derived markers for A/B.Br.001, B.Br.003 and B.Br.002, whilst amplifying the B.Br.001 ancestral marker. This SNP profile indicated KC2011 to be a B clade (B.Br.001/002), but not the rare KrugerB sub-clade. De novo assembly was carried out which resulted in 45 contigs (Table 1). The total genome contigs contributed to a 5.42 MB, with a GC content of 35%. A total of 6 047 coding sequences (CDSs) was determined in the KC2011 strain (Table 1). Comparative genome alignment of the B. anthracis KC2011 genome with Ames ancestor revealed no evidence of novel genes (Additional file 3: Fig. S1). The genome coverage of B. anthracis KC2011 was 99% covered to B. anthracis Ames ancestor (Additional file 1: Table S1; Additional file 2: Table S2). High copy number of pXO1 was observed represented by 725 coverage (725×). A high resolution tree of global B. anthracis strains was constructed to visualise the SNP grouping of the B. anthracis KC2011 (Fig. 2). This yielded 3 247 parsimony informative SNPs that were used to construct the phylogram. The B. anthracis KC2011 grouped in the B-clade separate from the KrugerB strain. The closest related branch was SA B. anthracis A0091. Strain KC2011 is the first B. anthracis identified as a B-clade lineage bacterium in over 20 years in South Africa and represents a new subclade in the B-clade. About 90% of the anthrax outbreaks reported world-wide arise from the A-clade, while less than 10% have been reported from the B-clade (KrugerB subclade) . The majority of the B. anthracis strains isolated from the northern part of KNP from 1970 to 1981 grouped in the B-clade (KrugerB subclade) but this clade became rare since the 1990s . Only one B strain reported between 1982 and 1997  to the extent that it was no longer isolated from 1997 until this report in South Africa. No significant anthrax outbreaks were noted outside the endemic regions of KNP (northern part of KNP) in 2011 according to state veterinary surveillance data. The isolate KC2011 was only identified because of the delicate conservation status of cheetah in Africa and because it was within the context of the broader Limpopo province area (i.e. outside KNP). 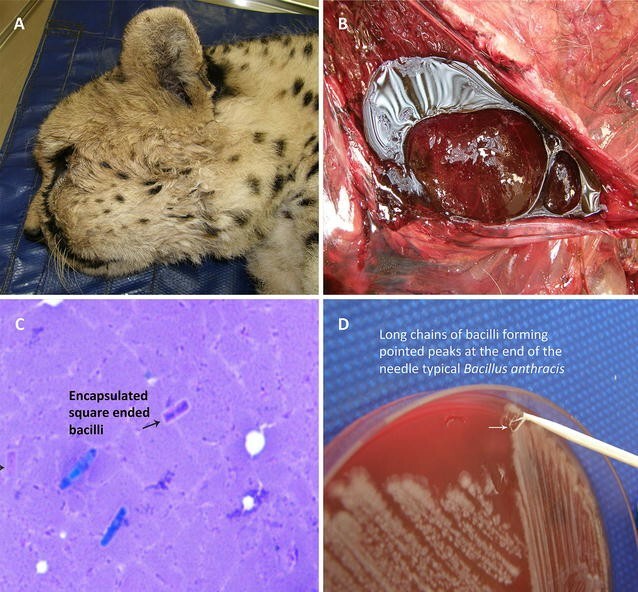 Cheetahs are especially susceptible to the B. anthracis exotoxins, however, they do respond well to vaccination with the Sterne vaccine . This study highlighted the importance of vaccinating cheetah, where logistically possible, in conservancies across Limpopo province. The phylogenetic structure of B. anthracis determined in this study (Fig. 2) is similar to other reported WGS-SNP trees [39–42]. Past B-clade (1965–1990) isolates from the State Veterinary archival collection have all clustered in the KrugerB lineage. WGS-SNP analysis defined KC2011 strain grouping as a distinctive sub-clade within southern Africa B.Br.010. Although, distant in terms of number of SNPs, the isolate A0091 and KC2011 belong to a common albeit broader lineage. The isolate A0091 is recorded as being from South Africa circa 1939, but has no other information to link it to KNP or Limpopo Province. There is also a dearth of information from the countries (Zimbabwe and Mozambique) bordering the South African province across the Limpopo River. Further surveillance of Limpopo Province is required to reveal whether deposits of B-clade isolates are subsisting outside KNP or whether this was an incidental mortality due to circumstances outside the realm of current monitoring criteria. Surveillance in the non-endemic anthrax regions is difficult as there are private game reserves and rural livestock farmers bordering KNP. Moreover the rural subsistence farmers (predominantly cattle farmers) are less likely to report mortalities and/or vaccinate their livestock thus complicating disease monitoring and control. This report of the B. anthracis KC2011 isolated outside the endemic region highlights the necessity of disease surveillance in non-endemic regions. The identification of KC2011 is significant in that mortalities linked to the B-clade have diminished over several decades and therefore was estimated to have disappeared from the local environment. This suggests a possible gap in surveillance of carcasses submitted for anthrax diagnostics in the Limpopo province especially in the non-endemic regions. It also has implications for the inclusion of the Sterne vaccine as part of the conservation measures to be included for cheetah in sanctuaries and private game reserves across the Limpopo Province in South Africa. The tree topology of the southern African strains was not well characterised due to the limited number of genomes available. Branch lengths vary according to inclusion of number and variety genomes in the data sets, as this explicates the informative SNPs used to construct the tree. Isolate KC2011 will thus be the basis for further typing of B. anthracis strains for southern Africa. KEL and AH performed the molecular, as well as, in silico analysis and drafting of the manuscript. RL and PR identified the mortality and performed the pathology evaluation. LDKL and HED performed the bacterial and DNA isolations. HvH participated in the design of the study, drafting the manuscript, revising it critically and provided funding. All authors read and approved the final manuscript. We would like to thank the Anthrax Advisory Committee. This study was funded by the National Research Foundation (NRF) of South Africa. 13104_2018_3366_MOESM1_ESM.docx Additional file 1: Table S1. Whole genomes of Bacillus anthracis retrieved from public database used in this study. 13104_2018_3366_MOESM2_ESM.docx Additional file 2: Table S2. Genome alignment of the Bacillus anthracis KC2011 to the B. anthracis Ames ancestor reference. 13104_2018_3366_MOESM3_ESM.tiff Additional file 3: Fig. S1. Alignment of Bacillus anthracis Ames ancestor genome with B. anthracis KC2011. Each colour block indicates homologous regions of the genome sequences. White areas in colour blocks indicate possible nucleotide variation absence or presence within the compared genomes.